My favorite 'Mainland' bakeries, specifically in Silicon Valley. One Asian, one mochi/manju and one European. Picking just one would be like deciding which of your children you like best. While you love them all fiercely, on any given day, you may be in the mood for one more so than the other. Most frequented. Li-hing, banana, vanilla, coconut, lychee, pineapple and lilikoi rock. Great selection of snacks--rice crackers, gummy candies, smoked stuff. Waiola's has been grinding out velvety smooth shave ice before the new Hawaii 5-0 ever included them in an episode. Texture, haupia, melona, lychee. Soft, almost slushy. The place to go for Japanese and American-Japanese mochi and manju. Mochi is a smooth-as-velvet, chewy dessert/snack. Shuei-do daily makes traditional azuki (red-bean), kuri (lima bean) or an (black sugar)-filled manju and also raspberry, milk, orange, or coconut-flavored mochi. If you want to order for special occasions, make sure you order ahead of time. They have a small selection of Kauai cookies and Japanese and Hawaii snacks. 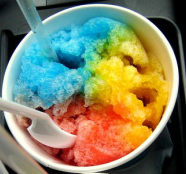 In the summer, they also sell shave ice. Absolutely consistently delicious pastries at this aptly named bakery. My favorite is the almond croissant, but I am also fond of their individual desserts. For family birthdays or just because, we usually get four different mini-desserts and then play pass the dessert. Our favorites are listed below. Almond Mini-croissants--(see above) Flaky, crunchy, pastry nirvana. Just the right amount of custardy almond filling. I would eat this every day if I could. Order ahead or go early because they sell out fast. Mango Raspberry Mousse--A creamy layer of mango mouse atop a perfectly sweet-but-not-too-sweet layer of raspberry mousse. And just enough fresh raspberries to snap everything together. Key Lime Mousse--My husband and my daughter's fave. Puckery-tart yet smooth and creamy. I have no idea how they do this, but it's awesome. Chocolate Mousse Cake--I don't much like chocolate, but I do like this mousse cake. It's rich chocolate flavor without the over-sweetness that a lot of chocolate desserts have.